On Aug. 11, billionaire George Soros announced a $35 million donation to the state of New York for a "Back to School" program that  coupled with $140 million of federal stimulus funds  would give each child on public assistance and food stamps $200 to start the school year. More than 850,000 families woke up the next day to find an extra $200 automatically added to their public-assistance debit account. Not a huge windfall, but enough for impoverished students to buy pencils, notebooks, protractors, a backpack and maybe some new school clothes. 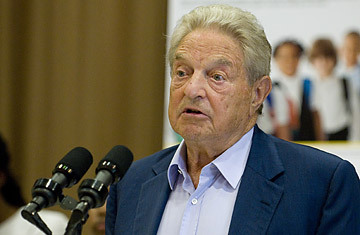 Soros was aiming his donation at a part of President Barack Obama's stimulus package that hasn't garnered much attention until now: a 4-to-1 federal matching program designed to help states assist poor families. This $5 billion pot of cash was set aside as an emergency fund to supplement the 12-year-old Temporary Assistance for Needy Families (TANF) program, i.e., the one that Bill Clinton boasted in 1996 would end "welfare as we know it." TANF typically provides cash assistance to families with no jobs. But as the recession has worsened, several states have seen a rise in the number of people needing welfare and food stamps. The stimulus fund allows states to do several things with their share of the $5 billion pool as long as they  or private groups like Soros'  pony up 20% of the overall cost; the feds cover the remainder. States can 1) provide more cash payments to families, 2) subsidize additional jobs or 3) set up onetime, nonrepeating benefit programs. New York's Back to School initiative, which used Soros' private donation as its initial seed money, utilized the third option, appealing to the Department of Health and Human Services, which runs TANF and its emergency fund, for the additional $140 million. Some municipalities are using the money to create jobs. In Perry County, Tennessee, for example, 300 private- and public-sector positions are being subsidized through the use of several million dollars' worth of the state's emergency-fund allotment. Some of these are just temporary, a short-term pick-me-up for the laid-off. Elsewhere, officials are eyeing the emergency fund for longer-term aid. Los Angeles, for example, has plans to kick off a yearlong employment program that will give subsidized jobs to up to 10,000 people. In New York, advocates of the Back to School program responded to criticism that the plan does nothing to ensure that each child's $200 allotment will actually be spent on school supplies. "Parents will do right by their children," says Mimi Corcoran, director of the Special Fund for Poverty Alleviation at Soros' Open Society Institute. "We really didn't have a concern about parents' spending the money incorrectly. They know what's best for their children. No strings attached was important for us." Still, Soros, who recalled a similar gift given to him when he was a poor student in postwar England, understands that one's personal philanthropy can go only so far. "Two hundred dollars is significant enough," he said when asked why he chose not to give each child a higher amount. "If you put in more, then you would probably have to set some conditions."